At the turn of the twenty-first century, a tide of nonviolent youth movements swept across Eastern Europe. Young people demanded political change in repressive political regimes that emerged since the collapse of communism. The Serbian social movement Otpor (Resistance) played a vital role in bringing down Slobodan Milosevic in 2000. Inspired by Otpor’s example, similar challenger organizations were formed in the former Soviet republics. The youth movements, however, differed in the extent to which they could mobilize citizens against the authoritarian governments on the eve of national elections. This book argues that the movement’s tactics and state countermoves explain, in no small degree, divergent social movement outcomes. 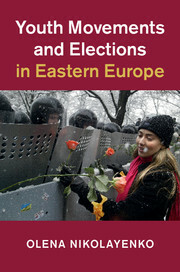 Using data from semi-structured interviews with former movement participants, public opinion polls, government publications, non-governmental organization (NGO) reports, and newspaper articles, the book traces state-movement interactions in five post-communist societies: Azerbaijan, Belarus, Georgia, Serbia, and Ukraine. Olena Nikolayenko is Associate Professor and Associate Chair for Undergraduate Studies in the Department of Political Science at Fordham University. Her research interests include comparative democratization, contentious politics, political behavior, women’s activism, and youth, with a regional focus on Eastern Europe, Russia, and Central Asia.